To be honest I’m not a massive fan of London gangster rap, and as soon as I saw the mention of PDC on the press release I kinda freaked! BUT, I kept my mind open and put on the CD as I would another and reviewed it for what it is. Now don’t get wrong, I don’t think it’s a CD that is gonna change the world of Hip Hop music, but it definitely has its place in the current climate and trend of urban music. Without a shadow of a doubt you can tell the music is written with sincerity and amongst the eighteen tracks included there where a few that really stood out. ‘Keep Movin’ has certain energy vocally while a mad wild piano riff gets the tune hype. ‘Life & Death’ shows us a different side to OC where he spits social commentary well, as he drops some ill metaphors along side Blax. 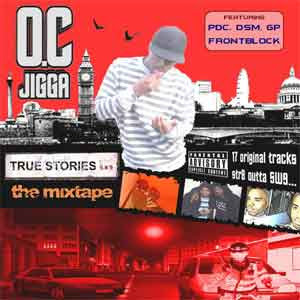 On the whole this CD is well worth checking, especially if ya like ya London rap with a bit of a snap to it!